During a lifting operation in connection with offloading of a vessel, a roughneck was crushed between a container hanging in a crane hook and a row of containers on the cargo deck. At the time, he was in a position which made it impossible to escape the cargo. A supply vessel was to be offloaded at Troll C. Prior to the offloading operation, a “pre-job conversation” (FJS) was held, in which the crane operator, signaller and slinger participated. Due to the weather conditions, the offloading of the vessel was carried out with the starboard offshore crane. This was not the most suitable crane for offloading the vessel because of restrictions in the lifting areas. After a few containers had been brought on board, the offloading operation was cancelled due to bad weather. A few days later the offloading operation was resumed following a new FJS. ”The Checklist for documented scheduling of lifting operations” was not used during any of these conversations. The injured roughneck left the FJS meeting before it was concluded. Approx. 30-40 containers were to be offloaded from the vessel. At the start-up of the lifting operation, it was agreed who would function as signaller and who would function as slinger (who was later injured). The two roughnecks exchanged functions several times during the lifting operation without notifying the crane operator. During the offloading operation, the signaller was interrupted several times by people who wanted help to carry out tasks in the area blocked off for the lifting operation. At a certain point in time shortly before the incident, the signaller left to perform a job, and left the immediate proximity of the lifting operation (approx. 30 metres away). There was not radio communication to this effect, but the crane operator noticed that he left and where he was. The crane operator then assumed that the other roughneck would perform both the signaller and slinger functions. The injured person received several containers alone on deck before the accident took place. During the work of placing a 7½ foot container, the container began to rotate. The container was then approx. 10 cm above the deck. The crane operator saw that the roughneck tried to stop the rotation, and discovered that he was positioned in an opening of approx. 1 metre between a row of containers and the container that was still hanging on the crane hook. Before the crane operator could notify the roughneck of the danger, the accident happened and the roughneck was crushed between the containers. Without further manoeuvring of the crane from the crane operator, the container turned full circle and the injured person took a few steps before laying down. The container was then put down, and the crane operator initiated an alert. Immediately after the roughneck was crushed, there was an alert onboard, and assistance arrived quickly. The injured person was brought to the sick bay onboard for examination and preparation for further transport with the SAR helicopter to Haukeland University Hospital. The area where the incident took place was secured/blocked off pending further investigation. The weather conditions for lifts from the vessel were favourable. 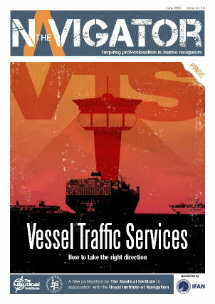 However, a movement of the offshore facility probably caused the cargo to shift toward the injured person. During the reconstruction of the incident, it was noted that the container moved (amplitude of pendulum) as it was lifted straight up from the deck (10-20 cm). The weather conditions were similar or better compared to the conditions at the time of the accident. 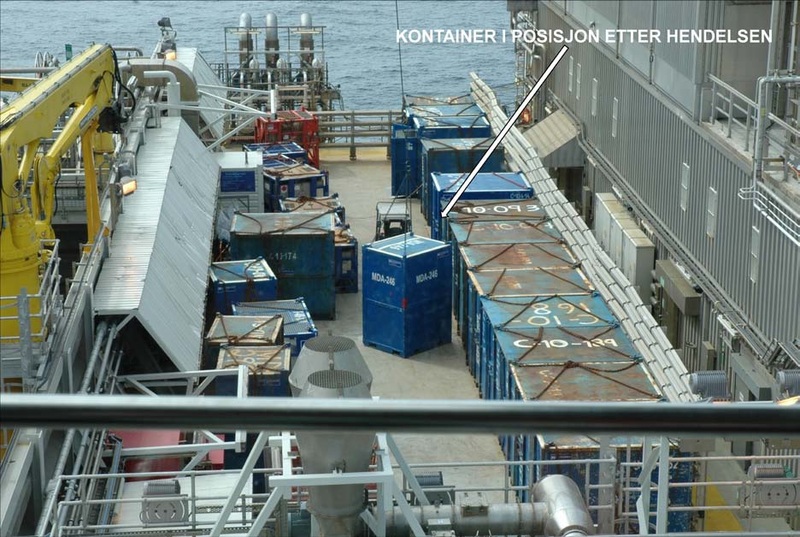 The above photo shows a reconstruction of the location with the container on the crane hook, and an indication of where the injured person was standing prior to being crushed. 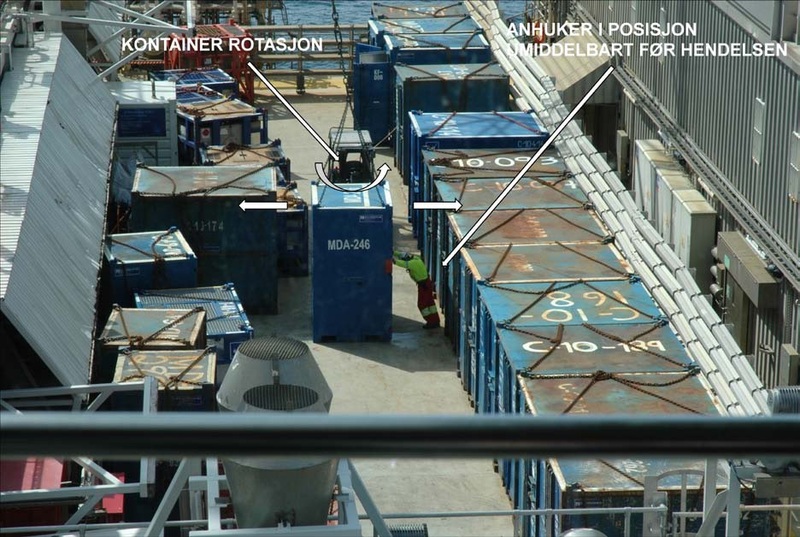 The above photo shows the assumed position of the container on the crane hook when the person was crushed. The above photo shows the assumed position when the injured person was crushed, approx. 30 cm between the containers. During an interview, the injured person presented a course of events which deviates from the one described above. 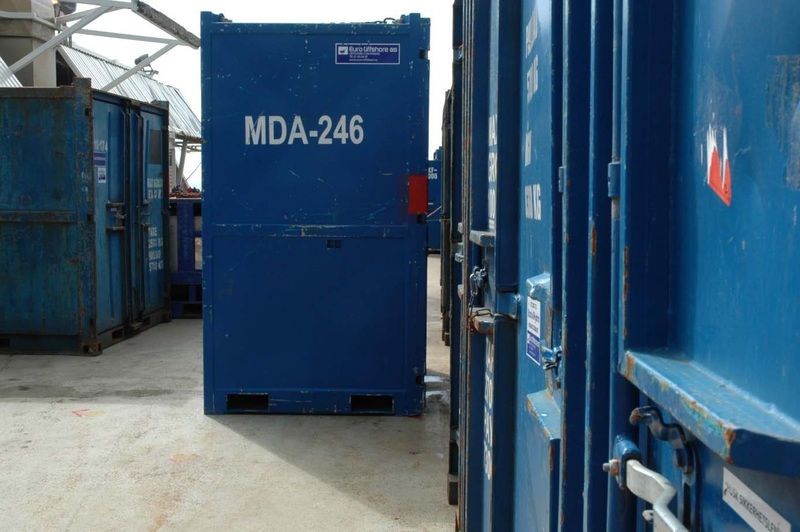 He primarily claimed that the container was placed on deck at the centre of the cargo area approximately 3 metres from the row of containers, that he did not hold on to the container, that it did not rotate, and that he therefore did not try to stop the rotation. He expressed no particular opinion concerning the cause of the incident. The actual consequence of this accident was that a roughneck suffered serious crushing injuries from the squeeze, which resulted in 7 fractured ribs, 2 fractures of the pelvis, some minor inner haemorrhaging and a punctured lung. Under slightly different circumstances, the incident could definitely have been a fatal accident. Inadequate planning. The planning of the actual lifting operation was inadequate, and the operation was started up even though planning was not carried out in accordance with applicable documentation. Missing description and communication of roles and responsibility for HSE coordinator/nurse. One person had a combined position as nurse and HSE coordinator. This combination can be problematic in connection with confidential information. The HSE coordinator was not familiar with the job description for the HSE coordinator onboard the facility where the incident occured. Moreover, there were no references to specific content or expectations for the job. Insufficient job description for person operationally responsible for lifting operations. The job description does not reflect the tasks and role of the operationally responsible person for lifting operations. Insufficient compliance with governing documents for lifting operations. The crane operator was not familiar with the local Troll C procedure for lifting operations. There were inadequate competence matrices /overviews. The overviews were not updated. There was insufficient communication of roles and responsibilities relating to lifting operations for signaller and slinger, and they exchanged functions several times during the operation without communicating this. Insufficient document management. Certain documents used as checklists lack traceability. The document format makes hardcopies difficult to read. No registration of incidents. Several known incidents related to crane and lifting operations on Troll B and C were not registered in Synergy.